I've enjoyed reading the Progressive Economics Forum, they've had many great posts and analysis but a post put out today titled "Fiscal “Crisis” In Context: Two Indicators" has me strongly disagreeing as I find the context presented to be much too narrow to provide proper context at all. The post looks at two indicators. Federal/Provincial Debt-to-GDP and Government interest costs as a percentage of GDP. While I do not believe in the austerity of the "austerity camp", I do believe my beliefs of the global economy would have me lumped in with them anyway. So, here is my rebuttal. This sort of analysis is the sort I try to stay away from, the 'straight by the numbers' type. The reason I decided to do "trend forecasting" instead of data-analysis is I find that data-analysis based predictions are often wrong. For instance, in the first chart in the post, federal debt is clearly going down until the collapse of 2008. Writing the same post with the same data back in 2007 and using the same "decline"/"leveling-off" historical logic, the increase in 2008 should have never happened, but it did, reality tends to dictate events, not charts. I keep having to come back to the one sentence Jim Flaherty has said in which I agree "Canada isn't an island". In fact, Canada couldn't act like an economic island even if it wanted to, we simply do not have enough domestic consumerism and trade to maintain growth in that context. Therefore, using that context as an indicator is simply not accurate - especially with the clear and visible downward global economic trend. The economy is 100% global, it's dependencies are global, its inputs and supply chain is global. Stephen Harper himself has told you all that "there isn't really a Canadian economy anymore, it's a global economy". There is a reason I was calling for Chinese stagnation while everyone else was calling for a Chinese boom, there's a reason I was confident in that call, and there's a reason that call has turned out to be 100% right. The problem with relying on China though is that on top of energy shortages their economy is over-heated. Their export base is falling out from under them and "housing bubble" is an understatement. Alberta may just find itself another stagnating economy by the time we can export to it. The other question of course is exactly how much oil can we supply to keep growth going to stop stagnation? It seems the "whole world" is all of a sudden on our doorsteps; but under ideal conditions we apparently will only be providing 3million barrels / day by 2020. While I was at Titan Trading Analytics, the 'holy grail' of HFT that we wanted to pursue was real-time news analysis. Financial data could only take us so far, it gave us no clue as to the mood of the market and it also didn't allow us to see important events until after they happened in the market. It's the expertise I learned pursuing this concept I use to forecast trends. Current events mean a lot more than historical data, you're not going to see this LIBOR scandal on charts until it's too late for instance. This brings up another problem with pure data based analysis, and that is that much of the data out there could be fraudulent to begin with, either intentionally or simply due to it being based on other fraudulent reporting. I'm not saying the data the author presents is tainted in any way, what I am saying is if it is tainted (let's say a few of the companies report invalid numbers) then you'd never know until it's too late. If you look at the collapse in the U.S., everything was fine, until it wasn't. Balance sheets that looked fine one day were totally invalid the next, this is the nature of the modern global economy. The source of concern is a new U.S. regulation meant to deter deposit-taking institutions that receive backstopping from Washington from engaging in speculative trading for their own—not their clients’—profit, a practice known as proprietary trading. Risky trades by global banking giants were central to the banking crisis that compelled former U.S. president George W. Bush to launch a $700-billion bailout of Wall Street in 2008. That is the President of the Canadian Banker's Association saying that if the U.S. addresses their fraud and problems, it may interfere with the ability of Canadian Banks and Canadian Governments to fund themselves. Doesn't exactly sound stable to me, especially since it was these practices which set the whole economy in a downward spiral, now does it? More than half of lending under the Fed’s term auction facility – the largest of its crisis programs – went to foreign banks. Details of the varied uses to which they put it may add to political criticism of the Fed. Rabobank of the Netherlands and Toronto-Dominion of Canada, two of the only banks in the world with triple A credit ratings, used more than $20 billion in cumulative Taf loans. In the summer of 2008, TD was borrowing $1 billion from TAF at rates of between 2 and 2.5 percent. For that borrowing it used the lowest quality – and hence highest yielding – collateral acceptable to the Fed. More than 80 percent of its collateral had a triple B credit rating at a time when such bonds yielded about 7 percent. TD could therefore have made a notional gross spread of about $4m a month during 2008. Notice the goal? "shore up confidence in the global financial system". Not, shore up confidence in the U.S. financial system. The U.S.'s USD ponzi scheme relies on other countries giving them stuff for USD and should those other countries reach crisis levels then the U.S. confidence economy is toast. The only thing backing U.S. dollars is confidence, and any sort of financial crisis might ultimately lead to protectionist policies and those types of policies might lead to countries reconsidering the USD altogether. Canada isn't currently influential enough in the global economy to determine it's own financial stability. We depend 100% on the global financial instruments, and those instruments are where the crisis is. As I've explained before, Canada will see it's debt problems unfold when the countries who supplement our income can no longer afford to do so, this primarily means the U.S. and shouldn't be any secret with recent actions by the federal government in consideration. According to this figure, not only has government debt service expense declined dramatically as a share of GDP since the bad old 1990s (when it peaked at close to 10% of GDP). Moreover, debt service has continued to decline despite the (modest) rebound in debt resulting from the recession. Debt service costs for all levels of government fell below 4% of GDP since the recession. 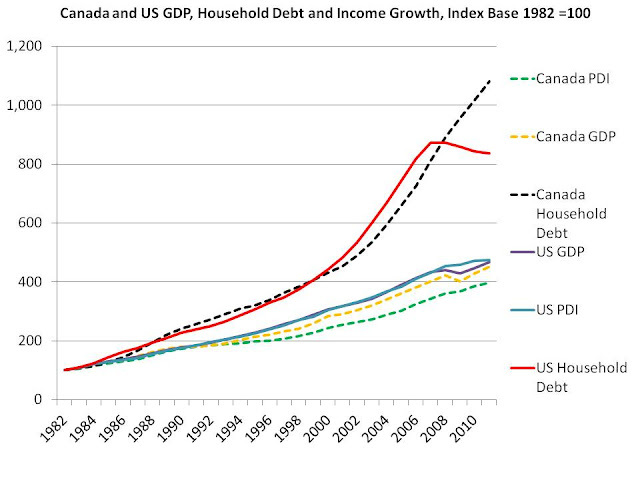 How could debt service costs decline, even while the debt burden (modestly) grew? Because average interest costs have declined. Like home-owners, governments have been able to refinance their debt to take advantage of today’s ultra-low rates. (Remember, even fiscally pressed provinces like Ontario can still borrow money today for 10 years at real interest rates not much above zero.) As older bonds come due and are refinanced, governments reduce their interest costs dramatically. Those savings have more than offset the incremental debt service costs associated wtih additional debt. So the claim that rising debt service costs are squeezing out more useful forms of public expenditure (not that conservatives support those programs, either) is empirically false. While that graph of debt servicing as a percentage of GDP is interesting, I think you'll all find this chart even more interesting. You'll remember recently (if you read my blog) that I explained why global growth is dead. The primary reason being that the globe's obligations currently outweigh real GDP. This is of course why interest rates are so low to begin with, and while the author praises low interest rates and rolling over debt as a practical solution, I again have to disagree. Between the low interest rates and bailouts, GDP world-wide should be flying and high inflation should be most country's main concern. Yet it isn't. Trillions upon trillions have been injected and the return on investment has been meagre at best. All money is created through loans, at the behest of banks. Now, it's not quite as willy-nilly as some people claim however. The statement "banks create money out of thin air" isn't quite correct. Banks must hold a certain amount in reserve (I believe currently in Canada it is 10%) of what they loan out. This is called "fractional reserve banking". Of course all loans have compound interest attached to them and that interest must be paid by other currency. Because interest is compounded on top of the currency loaned out, there is never enough currency in circulation to pay down all existing debts and thus bankruptcy or defaulting can occur. Not only can it occur, but it must occur, the economy is like a big game of musical chairs and at any given time there is someone out there without a chair. To get one they must borrow a chair from someone else, etc. It is at the moment that a person cannot fulfil their obligation and defaults that the bank has officially created money out of thin air. The reason being that the currency is already in circulation but the required amount of future economic activity or production to service it hasn't occurred. 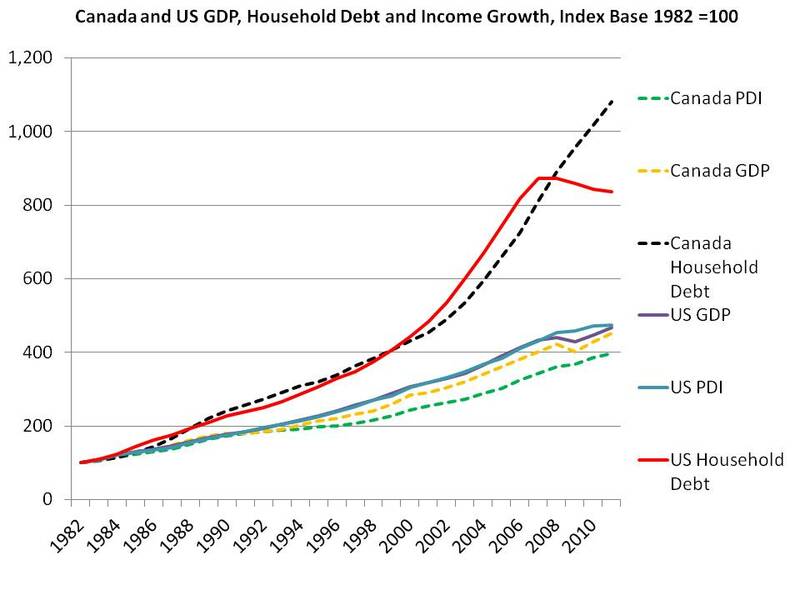 Both Jim Flaherty and Mark Carney have explicitly stated that a substantial amount of Canada's GDP growth is completely dependent on consumer debt. Within this context comparing governmental debt to GDP is completely meaningless because the GDP itself is reliant on consumer spending fuelled by consumer debt. This chart again fits perfectly with the story of the current global financial climate. The U.S. housing bubble has collapsed, but Canada's hasn't yet. Ours probably would have if the U.S. hasn't initiated the TARP program. With the U.S. being our number one trade partner and a significant portion of Canada's own industry actually owned by the U.S. (and now China), the injections in to the U.S. economy (and global economy) shored up the Canadian economy before too many people lost their jobs, although even within that short time span hundred of thousands did lose their jobs. Had the U.S. not bailed out foreign countries to stabilize themselves, our housing market would surely have crashed due to so many debt obligations not being met, just as it happened in the U.S.
Getting back to the point, just as I explained a few days ago that 1% of current GDP is a lot different than 1% of GDP 10 years ago due to speculative bubbles and over-leveraging, 4% of the Canadian GDP just for debt servicing is a significant amount, especially if current Canadian GDP is inflated due to the fraudulent leveraging systems in place. It's one big giant ponzi, and interest rates can only go so low. What the author proposes as a good thing is the same as saying. I can get another credit card for a cheaper interest rate than my current. My job is currently stable so to pay off the first credit card I'll use the second lower interest rate card and gradually my debt burden will decrease. First of all if an economist recommends this debt reduction strategy to you and you follow it, you get what you deserve. Second, this makes many assumptions about the future. Assumptions such as your job being stable, for if you say - get fired - or laid off - and you miss both payments, well then now you have more obligations to pay off. The authors first chart destroys the notion this is a viable plan, for if it was you would not see the increase in debt in 2008 due to the global financial meltdown (the U.S. got laid off). I'd agree that certainly we are looking at a very high probability of severe global meltdown a fairly short time down the road. However, when that happens I'm not clear why whether our national debt is 34% of GDP or say 37% will be the most major concern we have, particularly since a great deal of that debt is internal. If we reach a situation where the big five banks are going down like we were having a five pin bowling night, either we'll have to nationalize them (in which case the government owes the national debt to itself) or prop them up (in which case the meagre debt we had beforehand will be largely irrelevant compared to the commitments we take on) or let them go down (in which case we arguably no longer owe the debt at all). No matter what the case, in such a crisis what will matter more than bean-counting debt will be the government's willingness to maintain social safety nets and act as employer of last resort, keeping some sort of economy going. No, our national debt won't be the "main concern", it will be an after-thought when TSHF, but to say it isn't a problem currently is incorrect. We certainly shouldn't continue to over-extend ourselves because what's curently owing appears manageable. The main point which I try (and constantly fail) to make is that, Canada's economy is structured quite differently than our other western friends. Economically we are a lot closer now to say China, rather than the U.S. It is the foreign government debt which will do more harm to us than our own government debt, but when that happens and deflation really takes hold (this has only been a preview so far), we will quickly find that with the lost foreign income, our debt has become unmanageable. Canada still has time to avoid the fallout from the global economic collapse, but it must remove itself from that system. Assuming everything is fine, the debt is manageable, so we should just continue doing what we're doing and leverage more will simply take us down the path that the U.S., U.K., and Greece are becoming a preview of. On all my blogs, I've always maintained that Canada is near the end of the list of dominoes (currently we are not on the radar, yet) - but we are on the list anbd when it finally gets to us there will be no countries solvent enough to bail us out as we've had done so far. Thanks for the well-thought financial article. I am afraid that much more people than we expect are going to be effected by the fiscal crisis. The thing is that even people who didn't think they would have any money problems due to some fiscal regulations are now in danger of losing the money. I just hope that they will be smart enough to apply for payday loans Quebec online and then get the hold of their own money. Thanks again for this brilliantly informative article. I learned more about finances than I expected.